It's no secret that the position of FLOTUS is a demanding one, and seems to become more demanding with each administration. In earlier administrations, the primary tasks of first ladies were to host White House events, entertain the wives of Washington officials, and give the occasional White House tour. But in the 20th century, first ladies increasingly embraced activism, campaigning for voting rights, education, charity, and other special, important interests. First ladies like Helen Taft, Eleanor Roosevelt, Rosalynn Carter, and others assumed increasingly active roles in shaping their husbands' policy decisions, and often played pivotal roles in their husbands' campaigning. First ladies certainly led interesting lives throughout the administrations of their husbands, but in some cases, first ladies had pretty amazing jobs before becoming first ladies. The roster of first ladies who tackled some pretty impressive roles before taking on the busy, influential job of first lady includes a satirical writer, an aspiring geologist, a teacher for the deaf, and more. All were women who were interested in shaping their own destinies, and defied cultural expectations to independently pursue their own interests. Even in modern society, there's a quiet understanding that women should actively search for husbands and then devote their lives to their families. Here's a few badass career women turned first ladies who prove whether or not women are interested in having a family, we have no problem pursuing amazing careers in the meantime. Louisa Adams, wife of sixth POTUS John Quincy Adams, was quite the artist. She composed music on her harp and even wrote satirical plays, often about her indulgent upbringing. According to the University of Virginia's Miller Center, Adams was also quite the free spirit, and felt trapped in the White House, which she referred to as "a prison." Adams also raised her own silkworms, although whether or not she did this before becoming first lady is unclear. Abigail Fillmore, the wife of President Millard Fillmore, was the first first lady to earn a salary before marriage. Fillmore worked as a schoolteacher at Sempronius village school in New York. After three years of teaching part-time, she became a full-time teacher. She later became a private tutor as well, and eventually received offers for teaching positions at multiple private schools. McKinley graduated from Brooke Hall Female Seminary and began work as a clerk at Stark County Bank, which her father owned. She worked as a cashier, and eventually as a manager of the bank. Clerical work wasn't too uncommon for women toward the end of the 19th century, but it's worth noting McKinley was the only female worker at her father's bank. According to the National First Ladies Library, she was often met with scorn and disapproval for pursuing education and a career as a woman, and had to defend her right to work. Ellen Wilson, who was the wife of President Woodrow Wilson, pursued a decorated career as a professional artist prior to becoming first lady. Wilson's early years involved extensive travel to different cities around the world, and demonstrated both impressive literacy and artistic skills early on. She studied with the Art Students League in New York after graduating high school. Wilson went on to earn substantial income from selling portraits and sculptures. Grace Coolidge's husband, President Calvin Coolidge, may not have the best legacy as a cold, unsympathetic figure who consistently shut down unions and endorsed a flat tax. But Grace Coolidge herself appears to have been a warm, gracious woman, working as a teacher for deaf students. She took years of teaching courses at the Clarke Institute for the Deaf before eventually becoming a teacher. Lou Hoover is definitely one of, if not the, most interesting first ladies in American history. She was an aspiring geologist who studied and earned a degree in geology at Stanford University, and maintained a lifelong interest in the natural world. At Stanford, Lou also studied a variety of languages, learning Mandarin Chinese and occasionally speaking it with her husband in the White House when they wished for their conversations to be private. Lou previously considered a career in architecture. As a girl, she expressed interest in public issues and writing, penning essays about women's suffrage, and spent a lot of time outdoors, enjoying street baseball, basketball, archery, boating, sledding, roller-skating and ice-skating. 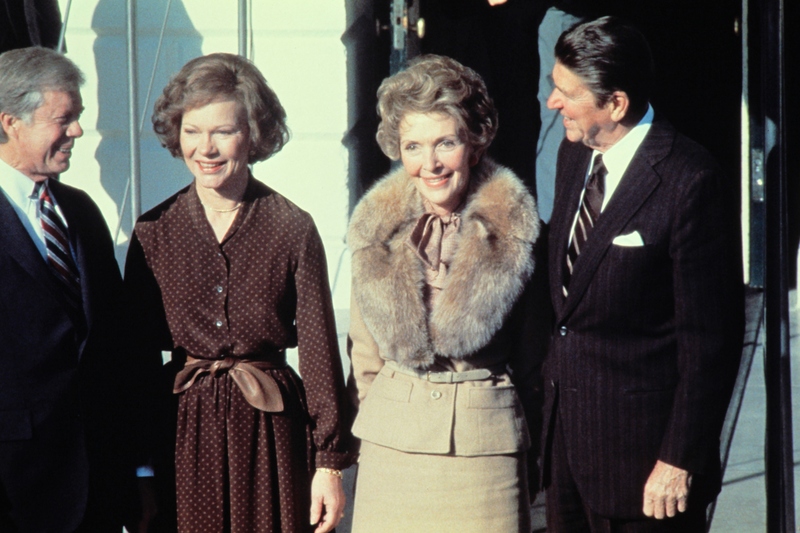 Betty Ford was the wife of President Gerald Ford, whose very brief administration immediately followed the disgrace and resignation of President Nixon. Growing up, Ford paid for her own dance classes by working as a model, teaching dance at summer camps, and even teaching her own dance classes to young girls. She went on to study dance at Bennington College, and worked with Martha Graham Auxiliary Dance Company. Throughout her career as a dancer, Ford also worked as a model, and also taught dance to African American communities. After serving as first lady, Ford went on to establish an alcohol and drug treatment center in California. We all know Ronald Reagan was an actor prior to becoming POTUS, but his wife Nancy Reagan had a decorated acting career of her own. Reagan worked as a department store sales clerk and nurse's aid in Chicago before getting involved in acting. She first took on nonspeaking and minor roles, before moving to Hollywood, obtaining a seven-year contract with Metro Goldwyn Mayer, and starring in 11 feature films.